Be the first to share your favorite memory, photo or story of Mark (Trapper). This memorial page is dedicated for family, friends and future generations to celebrate the life of their loved one. 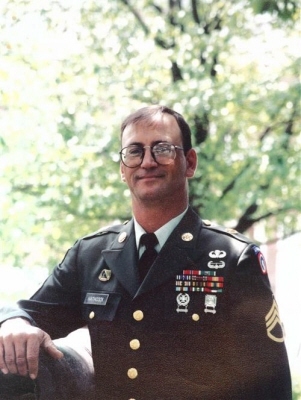 Mark (Trapper) Edward Hathcock, 60 of Russellville, Kentucky died on Wednesday, November 28, 2018, at Logan Memorial Hospital in Russellville, Kentucky. He was born Sunday, June 8, 1958 in Anchorage, Alaska, the son of the late Kenneth Hathcock and the late Patricia Malone Hathcock. He was the husband of Kathy Wilcutt Hathcock who survives. He was a member of Walnut Grove Baptist Church. Mark suffered multiple strokes. He fought like a soldier would for so long, but finally answered his call Home. He retired from the US Army after 21 years of faithful service. He served in Desert Storm and other conflicts, and was a member of 5th Special Forces Group, serving as a Sniper. He was proud to be Airborne, Air Assault, and LRRP. He was an excellent fishermen, hunter, and loved to trap. He was lovingly called “Trapper” by anyone who was blessed with his presence. He loved his wife, children and siblings. Also surviving are sons, Jacob Hathcock of Clarksville, TN, Dusty Cowan -(April) of Bowling Green, KY and Daniel Cowan -(Sara) of Franklin, KY, daughters, Kayla Meives - (Tommy) of Clarksville, TN and Brooke White - (Adam) of Russellville, KY, brother, Kerry Hathcock of Rock Island, TN, sister, Wrenda Jordan of Rock Island, TN; 15 grand children, Sean, Silas, Savanah, Conner, Austin, Shelby, Cody, Chase, Sawyer, Austin Jean, Malachi, Lily, Finn, Bates and Grady. He was predeceased by brother, Darius Hathcock. A Funeral service will be at 2:00 PM on Sunday at Price Funeral Home, Inc. located at 252 E. Green St. Lewisburg, Kentucky 42256 with Bro. Calvin Naylor officiating. Interment will be in Elk Lick Baptist Church Cemetery, Lewisburg, KY. The family will receive friends after 12:00 PM on Sunday, December 2, 2018, at Price Funeral Home, Inc., 252 E. Green St., Lewisburg, Kentucky. Memorial contributions may be sent to Price Funeral Home Inc. to help with funeral expenses P.O. Box 299 Lewisburg, KY 42256. To plant a tree in memory of Mark (Trapper) Edward Hathcock, please visit our Tribute Store. 6904 Green Ridge Spa Rd. "Email Address" would like to share the life celebration of Mark (Trapper) Edward Hathcock. Click on the "link" to go to share a favorite memory or leave a condolence message for the family.